Interstate 30 (I-30) is a 366.76-mile-long (590.24 km) expressway in the southern states of Texas and Arkansas in the United States, part of the Interstate Highway System. I-30 travels from I-20 west of Fort Worth, Texas, northeast via Dallas, and Texarkana, Texas, to I-40 in North Little Rock, Arkansas. The highway parallels U.S. Route 67 (US 67) except for the portion west of downtown Dallas (which was once part of I-20). Between the termini, I-30 has interchanges with I-35W, I-35E and I-45. I-30 is known as the Tom Landry Freeway between I-35W and I-35E, within the core of the Dallas–Fort Worth metroplex. I-30 is the shortest two-digit Interstate ending in zero in the Interstate system. The Interstates ending in zero are generally the longest east–west Interstates. It is also the second-shortest major Interstate (ending in zero or five), behind I-45. The largest areas that I-30 travels through include the Dallas–Fort Worth metroplex, the Texarkana metropolitan area, and the Little Rock metropolitan area. The section of I-30 between Dallas and Fort Worth is designated the Tom Landry Highway in honor of the long-time Dallas Cowboys coach. Though I-30 passed well south of Texas Stadium, the Cowboys' former home, their new stadium in Arlington, Texas is near I-30. However, the freeway designation was made before Arlington voted to build Cowboys Stadium. This section was previously known as the Dallas–Fort Worth Turnpike, which preceded the Interstate System. Although tolls had not been collected for many years, it was still known locally as the Dallas–Fort Worth Turnpike until its renaming. The section from downtown Dallas to Arlington was recently widened to over 16 lanes in some sections, by 2010. From June 15, 2010, through February 6, 2011, this 30-mile (48 km) section of I-30 was temporarily designated as the "Tom Landry Super Bowl Highway" in commemoration of Super Bowl XLV which was played at Cowboys Stadium. In Dallas, I-30 is known as East R.L. Thornton Freeway between downtown Dallas and the eastern suburb of Mesquite. I-30 picks up the name from I-35E south at the Mixmaster interchange. The Mixmaster is scheduled to be reconstructed as part of the Horseshoe project, derived from the larger Pegasus Project. The section from downtown Dallas to Loop 12 (Buckner Boulevard) is eight lanes plus an HOV lane. This section will be reconstructed under the East Corridor project to 12 lanes by 2025/2030. From Rockwall to a point past Sulphur Springs, I-30 runs concurrent with US 67. Through the city of Greenville, I-30 is known as Martin Luther King Jr. Freeway. I-30 continues northeasterly through East Texas until a few miles from the Texas-Oklahoma border, when the route turns east, towards Arkansas. I-30 enters southwestern Arkansas at Texarkana, the twin city of Texarkana, Texas. I-30 intersects I-49, after which it travels northeast. I-30 then passes through Hope, birthplace of former President Bill Clinton. I-30 then serves Prescott, Gurdon, Arkadelphia, and Malvern. At Malvern, drivers can use US 70 or US 270 to travel into historic Hot Springs or beyond into Ouachita National Forest. There, US 70 and US 67 join I-30 and stay with the interstate into the Little Rock city limits. Northeast of Malvern, I-30 passes through Benton, before reaching the Little Rock city limits. From Benton to its end at I-40, I-30 is a six-lane highway with up to 85,000 vehicles per day. As I-30 enters Little Rock, I-430 leaves its parent route to create a western bypass of the city. Just south of downtown, I-30 meets the western terminus of I-440 and the northern terminus of another auxiliary route in I-530. I-530 travels 46 miles (74 km) south to Pine Bluff. At this three-way junction of interstates, I-30 turns due north for the final few miles of its route. Here I-30 passes through the capitol district of Little Rock. I-30 also creates one final auxiliary route in I-630, or the Wilbur D. Mills Freeway, which splits downtown Little Rock in an east–west direction before coming to its other end at I-430 just west of downtown. After passing I-630, I-30 crosses the Arkansas River into North Little Rock and comes to its eastern terminus, despite facing north, at I-40. At its end, I-30 is joined by US 65, US 67, and US 167. US 65 joins I-40 westbound, while US 67 and US 167 join I-40 eastbound from I-30's eastern terminus. The Dallas–Fort Worth Turnpike was a 30-mile (48 km) toll highway in the Dallas–Fort Worth Metroplex. It operated between 1957 and 1977, afterward becoming a nondescript part of I-30. The road, three lanes in each direction but later widened, is the only direct connection between downtown Fort Worth and downtown Dallas, Texas. In October 2001, the former turnpike was named the Tom Landry Highway, after the late Dallas Cowboys coach Tom Landry. The proposed expressway was studied as early as 1944, but was turned down by the state engineer due to the expense. However, in 1953, the state legislature created the Texas Turnpike Authority, which in 1955 raised $58.5 million (equivalent to $436 million in 2018) to build the project. Construction started later that year. On August 27, 1957, the highway was open to traffic, but the official opening came a week later on September 5. The turnpike's presence stimulated growth in Arlington and Grand Prairie and facilitated construction of Six Flags Over Texas. At the end of 1977, the bonds were paid off and the freeway was handed over to the state Department of Transportation, toll collection ceased, and the tollbooths were removed in the first week of 1978. It served as I-20 between Dallas and Fort Worth until the current I-20 route to the south was opened in 1971. Afterwards, I-30 was extended from its end at the "Dallas Mixmaster" interchange with I-35E (also the east end of the turnpike) to follow the turnpike, and the former I-20 in downtown Fort Worth, west to modern-day I-20. The existing US 67 route was already in heavy use in the early 1950s, at which point it was twinned from just east of Dallas to Rockwall and also near Greenville. The DFW Turnpike linking Fort Worth to Dallas was completed by 1957, becoming the first segment of I-30. The twinned US 67 routes were upgraded to Interstate Highway standards beginning in 1961, forming the R.L. Thornton Freeway. By the mid 1960s, much of I-30 was under construction. The majority of the route was completed by 1965, but a 40-mile (64 km) stretch through marshland between Mount Pleasant and New Boston remained unfinished. This remaining segment was finally built and opened to traffic in 1971, completing I-30. I-30 was proposed to be extended along the US 67 freeway from Little Rock. However, this conflicted with the Missouri Department of Transportation's plan to extend I-57, which is also planned to use US 67. In April 2016, a provision designating US 67 from North Little Rock to Walnut Ridge, Arkansas, as "Future I-57" was added to the federal fiscal year 2017 Transportation, Housing and Urban Development funding bill. The provision would also give Arkansas the ability to request any segment of the road built to Interstate Highway standards be officially added to the Interstate Highway System as I-57. 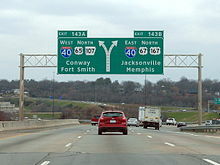 Had I-30 been extended, there were plans to upgrade AR 226 to Interstate standards and designate it as "Interstate 730". I-130 was a proposed auxiliary route of I-30 that was planned to be concurrent with I-49. Once the eastern segment of the Texarkana Loop had been upgraded to Interstate standards, I-130 was to have been signed; however, it is now part of I-49. 99.5 61B Pres. George Bush Tpk. Interstate 30 Business was a business route in Benton, Arkansas. It ran from exits 116-118 on I-30 from approximately 1960 to 1975, concurrently with U.S. Route 70C. ^ a b Federal Highway Administration (December 31, 2013). "Table 1: Main Routes of the Dwight D. Eisenhower National System of Interstate and Defense Highways as of December 31, 2013". Route Log and Finder List. Federal Highway Administration. Retrieved February 11, 2014. ^ a b Google (February 15, 2008). "Overview Map of I-30" (Map). Google Maps. Google. Retrieved February 15, 2008. ^ a b Wilonsky, Robert (June 10, 2010). "Maybe One of the Few Times We'll Use 'Cotton Bowl' and 'Super Bowl' in Same Sentence". Dallas Observer. Unfair Park blog. Retrieved June 10, 2010. ^ "TxDOT Sets in Motion Much-Anticipated Dallas Horseshoe Project" (Press release). Texas Department of Transportation. November 15, 2012. Archived from the original on November 19, 2012. Retrieved November 16, 2012. ^ Benning, Tom (November 15, 2012). "Contract OK'd for Horseshoe Project's Massive Rebuilding of Downtown Dallas Freeways". The Dallas Morning News. Retrieved November 16, 2012. ^ "Project Pegasus Overview". Retrieved April 7, 2012. ^ "The East Corridor Website: Objectives and Goals". The East Corridor. Retrieved May 17, 2017. ^ Kellar, Brad. "Multiple events planned to honor Dr. King". Herald-Banner. Retrieved May 25, 2016. ^ "Bus Crash near Benton Kills Child, Injures 45 Others". Magnolia Reporter. Retrieved December 23, 2018. ^ "I-30 Project Slowed by Potential Impact on Oldest Neighborhood in". Arkansas Online. Retrieved December 23, 2018. ^ "Authorities ID Man Pulled from Arkansas River After He Crashed on I-30". Arkansas Online. Retrieved December 23, 2018. ^ "Fort Worth Flashback: Turnpike Stimulated Growth Between Fort Worth, Dallas". City of Fort Worth, Texas. Retrieved May 14, 2018. ^ Office of John Boozman (April 25, 2016). "Boozman Provision in Appropriations Bill Paves Way for Interstate Status of US 67" (Press release). Office of John Boozman. Retrieved April 26, 2016. ^ "A Faster Trip From Region 8". Jonesboro, AR: KAIT-TV. March 12, 2003. Retrieved July 18, 2016. ^ "Jonesboro Chamber of Commerce Headed to Nation's Capitol". Jonesboro, AR: KAIT-TV. February 20, 2004. Retrieved July 18, 2016. ^ Arkansas State Highway and Transportation Department (January 2001). "Interstate 130 to Be Designated in Arkansas" (Press release). Arkansas State Highway and Transportation Department. Archived from the original on December 13, 2013. ^ "Archived Tourist Maps". Arkansas State Highway and Transportation Department. Archived from the original on June 22, 2011. Retrieved July 8, 2011. Wikimedia Commons has media related to Interstate 30. This page was last edited on 5 March 2019, at 22:56 (UTC).